Australian Giftguide is the perfect complement to the printed magazine. Updated daily, it provides readers with breaking industry news as well as a free weekly e-newsletter – subscribe. The website is used as a product sourcing tool and boasts an electronic version of the directory with thousands of industry listings. 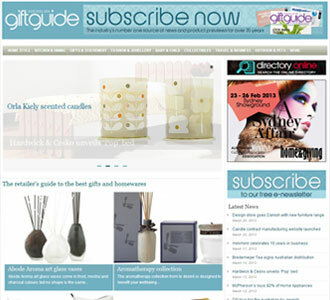 Australian Giftguide magazine is an award-winning quarterly publication that is regarded by retailers as the ‘Bible’ of the gift and homewares industry. For 38 years, the full-colour printed quarterly magazine has been a trusted source for product and trade fair news. The magazine is recognised as an essential business resource and is read by tens of thousands of gift and homewares retailers throughout Australia. The annual directory issue, sent to over 20,000 retailers, is an invaluable reference tool and includes comprehensive information about more than 2,000 suppliers, listing over 10,000 products across 120 categories as well as 1,500 brand names.